Shopping is a recreational activity where a very pleasant. With our shopping to entertain and pamper yourself with a desire to meet what. Moreover when traveling. At that time, we did prepare ourselves to indulge, including the desire to shop. Sometimes the desire and ability to meet are not always consistent. Always greater desire than ability. 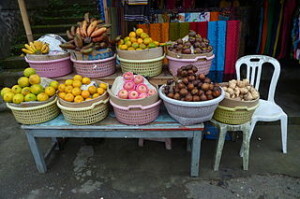 In Bali, so many craft items are offered. You need to be a surefire tips to channel the desire and ability that is often contradictory. The following recipe can help how cheap shopping in Bali. How much you still have to make a shopping list or not, know exactly what you want to buy. Next, specify the budget ceiling will you tolerate. Find as much information as possible about the sale of goods that you want to buy. The information you can get from various sources such as brochures, travel magazines, the internet, or local communities. Do not be too lean on tour guide for this. Some of them rely on commissions from art shops. Therefore, they tend to take you to a place that gives them a commission, not to a place that gives you the best price. In the usual tourist attractions, there are several places that offer similar items. Origin remains polite, do not be embarrassed to see the quality of the goods and bargain for the lowest possible price. with did offer calm, without showing the impression you are very interested in an item. Ask half the bid price of the bids of the seller, do not forget to smile. A smile is the currency too, even if you can bargain with the style of humor. Humor is very powerful to break the ice in while shopping. If not given, just go to another stall. If you are still considered beneficial offers by merchants, they will call you and deliver the goods in accordance with your bid. If it is not called again, meaning you bid too low. Make the lowest rate offered by the traders as a benchmark to bid elsewhere. If it does not have enough time to look for, do not shopping. Shopping should calmly. If in a hurry often will get disappointment.